Walter Greenleaf, PhD, is a research neuroscientist and medical product developer at Stanford University. Walter is known internationally as an early pioneer in digital medicine and virtual environment technology. 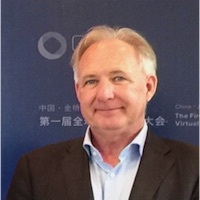 He is considered a leading authority in the field of medical virtual reality technology, with over three decades of research and product development experience. Walter is currently a Distinguished Visiting Scholar at Stanford University’s mediaX program, a Visiting Scholar at Stanford University’s Virtual Human Interaction Lab, Director of Technology Strategy at the University of Colorado National Mental Health Innovation Center, and Member of the Board of Directors for Brainstorm: The Stanford Laboratory for Brain Health Innovation and Entrepreneurship. Previously, Walter served as Director for the Mind Division of the Stanford Center on Longevity, where his focus was on advancing research on age-related changes in cognition. In addition to his research at Stanford University, Walter is Senior Vice President of Strategic & Corporate Affairs for MindMaze and Chief Science Advisor to Pear Therapeutics. He is a VR technology and neuroscience advisor to several early-stage medical product companies, and is a co-founder of Cognitive Leap.